7:30 a.m.: Power was cut for several hours overnight. Unfortunately the electrical supply was already becoming irregular in the weeks before the coup, due to increasing demand during the hot season (March through early June). But until Thursday, outages came only once a day and lasted 30 minutes to two hours at most. We had at least four hours of blackout during the day Thursday and another four hours overnight. Perhaps these cuts had nothing to do with the coup, but ask the Iraqis — the combination of hot weather, electricity shortages and political instability is never a good thing. I need to be clear about something: I’m stuck at home. I haven’t left my house since late Wednesday afternoon. This isn’t only due to the US Embassy’s “shelter in place” instructions; it also stems from the advice of Malian friends who have called me up to warn me against going into town. And there’s only so much one can learn about the situation in Bamako from the confines of a house in Badalabougou. I can say that there’s very little gunfire audible from here. I did hear occasional shots overnight and this morning, but few and far between. ORTM television is off the air this morning (I read online that the mutineers took away all the cameras), and Africable is showing music videos. Since the 1990s Mali has developed a vibrant (though often amateurish) private media sector, particularly FM radio stations and a growing number of newspapers. But I’m not seeing the Malian media step up to its responsibilities here in a big way. Most Malian newspapers, at least those canvassed by the website Maliweb, have yet to address the events of the last two days. Local radio stations in Bamako have mostly been silent about the coup, probably for fear that the soldiers will shut them down if they say anything critical. The only thing I heard about the coup on Bamako radio has been the announcements yesterday afternoon from CNRDR leaders justifying their actions. Usually the airwaves here are filled with call-in shows where listeners freely vent their frustration with government and politics; I’m not hearing those now. Maybe it’s just a temporary hiatus, but I’m concerned that the coup has intimidated the media into virtual silence. The few references to the coup and its aftermath I’ve found online by Malian papers are by B.S. Diarra of Maliba Info, including one criticizing the curfew because it keeps Muslims from getting to their mosques for pre-dawn prayers, and another recounting an attack by mutineers on the headquarters of the UNTM trade union, which was subsequently set on fire. In a country with what had been touted as some of the strongest democratic traditions in the region, one might have expected a military coup to generate more opposition. In the course of less than 24 hours, a coterie of junior army officers managed to erase two decades’ worth of democratic institution-building: the Malian constitution has been suspended and all institutions “dissolved.” All this goes to show how fragile Mali’s democracy really is. Or perhaps was. 7:37 a.m.: Two “CRUMP CRUMP” explosions, coming from downtown. Then silence. 8:00 a.m.: ORTM is back on air, rebroadcasting a communiqué by Capt. Sanogo first made yesterday, condemning “acts of vandalism” which he says are intended to keep the CNRDR from reaching its goal. This is followed by a new communiqué by Lt. Amadou Keita, his first appearance on TV as far as I’m aware. Surrounded by comrades in arms and speaking in Bamanan, he exhorts viewers to stay calm and to stop looting. This is followed by the regular Friday morning Islamic show, then, of all things, a pleasant 1998 documentary by Radio Canada about stone masonry on Ontario’s Rideau Canal. 10:30 a.m.: I speak via phone with a Malian scholar who’s also a member of the influential Haut Conseil Islamique (HCI), a Muslim lobby group that has accumulated significant political clout over the last 2-3 years. My counterpart says he’s happy about the coup, and offers a French expression, “A quelque chose, malheur est bon“: essentially, this cloud has a silver lining. The coup has released tensions that had been building up for many months, and can usher in a more salutary approach to governing than had been practiced under the Touré regime. He thinks there was no way to get Mali out of its present mess as long as Touré remained in power. No doubt the HCI senses an opening that it can take advantage of. An article by Jeune Afrique reports that looting has continued downtown and in a few outlying neighborhoods, and that President Touré’s prime minister, Mariam Kaidama Sidibé, is now among those being detained by the military. 1:00 p.m.: After being house-bound for almost two days, I venture out and walk about 800m east through my neighborhood to attend Friday prayers, crossing through the Badalabougou market on my way there. It’s surprising how normal everything appears: the usual number of shoppers, the usual number of vendors, the usual amount of traffic. I check in with a hardware store owner and a tailor I know. Both have been open for business all day, and one was even open yesterday morning. Diallo, the tailor, is in my aikido class, and tells me he would have attended last night if the power hadn’t cut out. (Apparently the curfew meant nothing to him.) At the mosque, the usual number of worshipers is present for the usual set of prayers. The only unusual thing is that the imam adds some extra benedictions at the end of his wajilu (sermon): “May God bring peace to Mali,” which he repeats a few times, each repetition eliciting a hearty AMINA from the congregation. 5:00 p.m.: Life truly seems to be settling down in Bamako. I’m hearing from friends in other neighborhoods that things are more or less “back to normal” there as well. I haven’t heard any gunshots at all since early this morning (and even then they were rare). We’re cautiously optimistic that the security situation has stabilized. Politically things are still quite uncertain. Coup leader Capt. Amadou Sanogo continues to assure anyone who will listen of his good intentions to hand over power once democratic elections can be organized, but he won’t give a timetable for such a transition. 6:00 p.m.: Taking a break from my routine as part-time researcher and part-time teacher, what with being stuck at home for most of the last 2 days, I’ve spent considerable time both consuming and communicating with news media. Over the phone I spoke about the current situation in Bamako on the BBC’s “World Have Your Say” yesterday and was interviewed by Radio France International’s English service. An analysis I wrote has also just been published on a news website called Think Africa Press. Ibrahim Boubacar Keita, one of the most likely frontrunners in Mali’s (now unlikely) presidential elections — and one of the few significant candidates not yet taken into military custody — has issued a statement firmly condemning the coup, and calling on soldiers to release their political detainees. Such statements have been rare so far. One candidate, Dr. Oumar Mariko, has actually come out in support of the putsch, and a “22 March Movement” has reportedly met at Mariko’s SADI party headquarters to issue a statement in solidarity with the CNRDR. 7:30 p.m.: ORTM interrupts its traditional music broadcast for a new communiqué by the CNRDR. 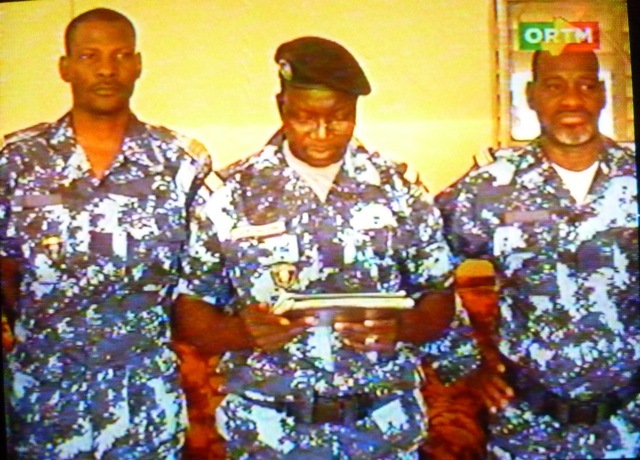 Seven members appear in the studio (two police and five army); one reads a short statement saying that in response to a rumor that the ORTM studio was under attack and that Captain Sanogo had been killed, the CNRDR wanted to announce that no such attack has take place and that all the “forces vives” of the nation are behind the CNRDR. [I’ve been trying for weeks to find a good translation of forces vives, a term that keeps cropping up in recent Malian political discourse — literally it means “living strengths,” but here denotes some leading segments of the population.] Captain Sanogo does not appear on screen, however, nor do any of the previous CNRDR spokesmen. The rumor had just circulated perhaps 20 minutes earlier on the Malilink forum, and also alleged that Americans were supporting the counter-coup. 7:42 p.m.: The exact same communiqué is read again on ORTM, but this time there are about 15 troops in the studio. 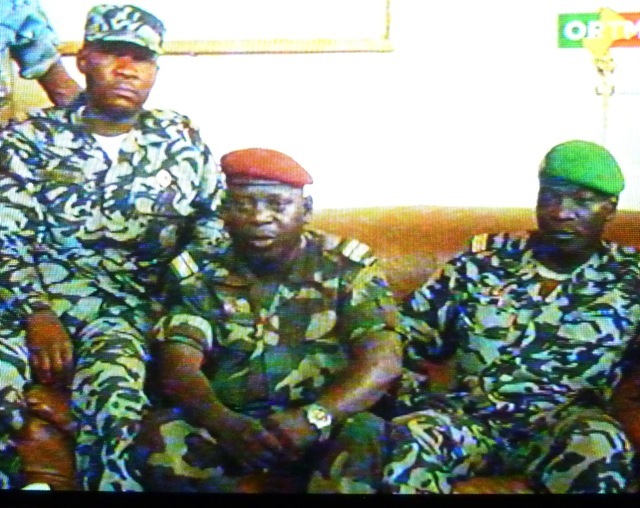 What’s interesting about this group is that, for the first time, one of the soldiers is seen wearing a red beret — reserved for the army’s parachute regiment, the unit that is believed to be most loyal to President Touré and has been rumored to be preparing a counter-coup. Perhaps the CNRDR is trying to show that they have the allegiance of all military units. A similar group of troops is pictured a few minutes later, this time the statement is read in Bamanan by the same Lt. Keita who read the Bamanan statement this morning. But the red beret is missing from the scene. Here’s a suggestion to the CNRDR: When standing in the ORTM studio to air a message to the Malian people, turn off your cellphones. 8:30 p.m.: Maliweb is running a banner reading “Red berets on the move in Bamako, stay tuned….” And the website of French newspaper Le Monde is carrying an unconfirmed report of a counter-offensive getting underway by the parachute regiment in Bamako. I can hear heavy weapons fire again coming from the downtown area. 9:30 p.m.: The counter-coup story is also relayed by the Associated Press. I haven’t heard further gunfire however. 10:30 p.m.: ORTM television news begins, hours later than usual. It airs an interview with Capt. Sanogo, apparently filmed sometime earlier today (there’s daylight coming through the window behind him), plus typical president-going-about-his-daily-business footage of Sanogo meeting with the head of the customs service, the directors of various government departments, etc. Statement supporting the CNRDR are read from representatives of the northern-based Ganda Iso militia, a youth organization (la Formation Nationale des Jeunes), some unknown political parties, and the union of customs officers. “Vive le Mali, vive le CNRDR,” they conclude. Immediately following the news broadcast, a new statement from the CNRDR leadership is aired. Capt. Sanogo speaks directly to viewers, first in French, then in Bamanan, to assure them that he is fine and that every unit of the army is supporting him. The camera pans around the room to show police, gendarmes, regular army, National Guard and at least two soldiers in red berets. It’s unclear when these clips were recorded. 11:15 p.m.: I hear one explosion coming from the northeast. Then silence. Thank you so much for keeping us updated, Bruce. It’s helpful to have your articulate and personal perspective. Thinking of your family (among others) and anxiously awaiting more posts. Interesting, I’ll have to look for those online sources! Thanks for keeping us updated, Bruce. Thinking of you! Thanks for the updates.You have a wide following on Facebook, with many RPCVs posting and checking in on your blog. Keep the news coming and stay safe! Are you sure we haven’t met? Your name definitely rings a bell – were you ever down in Kadiolo or Sikasso? Your current 1PM update is reassuring. Glad you were able to get out and that things look relatively normal. We will keep our fingers crossed for you all. Getting more information from your blog posts than anywhere else. My daughter, Devon works w/ MHOP and pointed us to your blog. Thanks for the updates. Interesting situation! Cheers, Linda. I just spoke to Devon who seems to be doing fine. Thanks for the news. I’m a former Peace Corps Mali volunteer, and this whole story is just breaking my heart. May God bring peace to Mali, indeed. I am following too, and thinking of you and your family as well as all my host family and friends in Mopti Mara la. I really appreciate your updates and have shared your blog on my Facebook page. Thank you so much for keeping us posted. Ala ka here di Mali la. Thanks Nina. Hope you’re well! Thanks for providing infinitely more information than I can find elsewhere. Be safe. We are all hoping for a quick and positive resolution. Cheers, Jon! Hope you and yours are all doing well. Hi Bruce, Great posts. Currently in Mali myself and I find your posts very informing! Thanks for that. Thank you for writing from Badialabougou & let’s hope this will be over soon and democracy stronger than before. Sekou, i ni baara! I ni segen! Our thoughts are with you, Oumou, Rokia, and Zachary. I really appreciate the commentary you have been running. It’s good stuff. I be se sebenina kuy! Have you by chance ever met our friend Abdoul Diallo (he was formerly a professor at SIT)? He lives in Badalabougou somewhere, too, I think. I’ll look into it and try to get his number to you. Allah k’i an’i somogow kisi ko jugu beh ma. Ka hamina ko beh nogoya. Ka sababu nyuman ka nye. Ka jamana deme. Ka hakili nyuman di Malidenw beh ma. Ka here caya Malila! Amina, Mugu. I remember meeting Abdoul with you once but I don’t recall if it was in BKO or in VT. It would have been a few years ago. Amina, Jeneba! I have seen a few items on HP and Slate but they are all wire stories from the same AP/Reuters sources. For what it’s worth, Bakary says hello. Forces vives not the population, more the leading parts of the populations, or an equivalent of the french word ” les cadres “. Not far from marxist concept “avant-garde”.